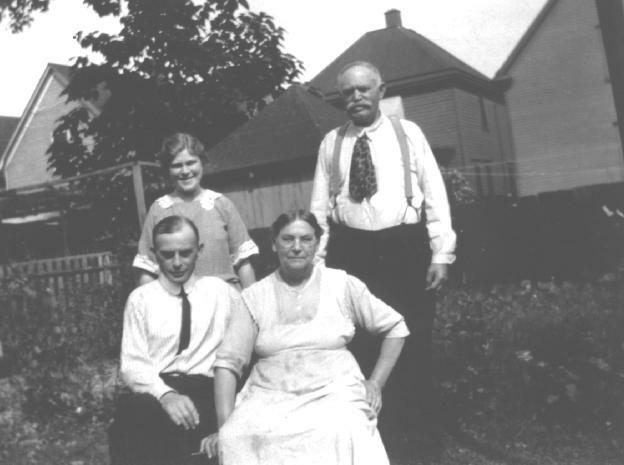 Frank J. Schwert, with his mother Julia (née Schlia / Schlee), his sister Martha, and his father, Franz Carl Schwertfeger / Schwert. (No date). 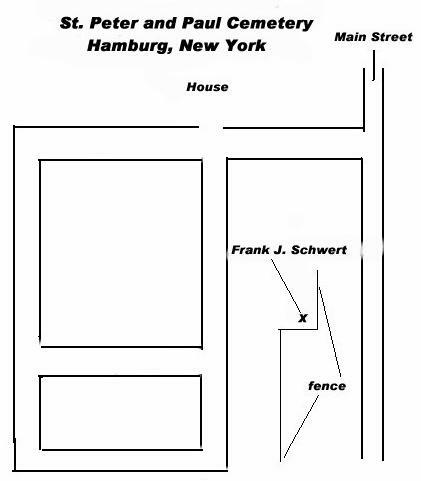 (Click to enlarge, 32K) Frank J. Schwert was born on January 26, 1883, in Buffalo, NY, USA. He was the son of Franz Carl and Julianna Catharina (née Schlia / Schlee) Schwertfeger / Schwert. Frank was a lithographer. He served his apprenticeship in Washington. 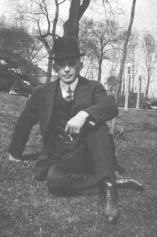 He then moved to Chicago, where he became of member of the Union 4, International Association of Amalgamated Lithographers of America, Chicago. Frank's World War I draft registration record (signed in 1918) shows Frank living at 34 East Oak in Chicago. The 1930 U.S. Census shows Frank rooming at 519 Center in Chicago. 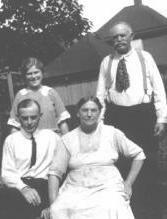 There are family stories showing that Frank had close relationships in Chicago with Ferdinand (= "Fred") and Anna (née Klinkusch) Liebhaber. 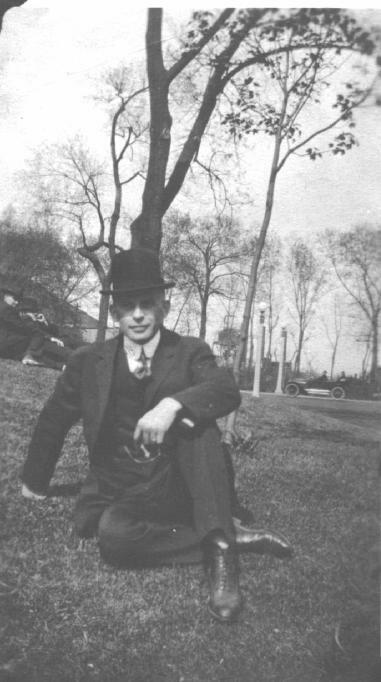 "Fred" Liebhaber was employed in Chicago as a mover. His wife Anna was the daughter of Albrecht (= "Albert") and Francisca (née Schlia) Klinkusch. Because Francisca was sister to Julianna Catharina (née Schlia/Schlee) Schwertfeger/Schwert, this places Frank and Anna as first cousins. 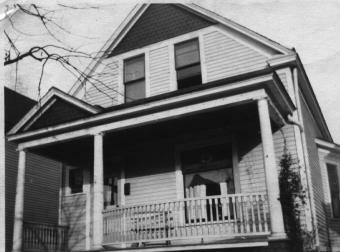 Later, Frank moved back home with his parents at 115 Nevada Street, Buffalo. 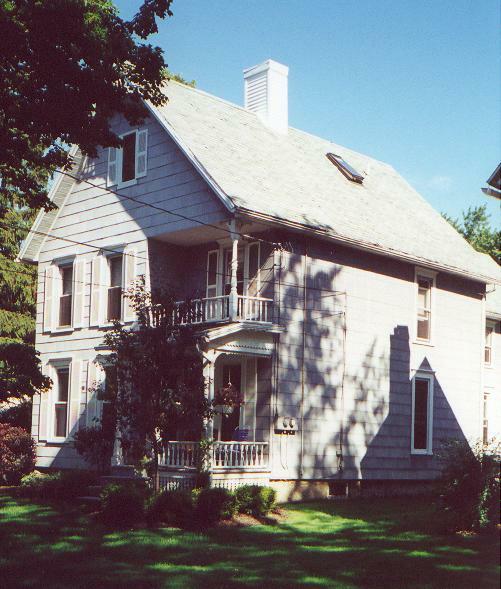 When his mother died in 1938, Frank and his brother Joseph moved to 152 East Main Street in Hamburg, NY, where Mary ("Mayme") Kruse maintained a boarding house. 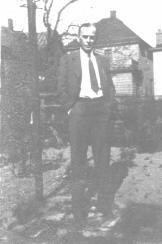 Frank worked for Hayes Lithographic Company and retired in 1948. He never married. Frank loved to travel. He went to Florida and out west. He saw the New York World's Fair in 1939. Frank was a colorful, pleasant, slender-built man. He frequently suffered from severe migraine headaches. Frank loved to tell the same corny jokes over and over: "When I drink, everybody drinks. When I pay, everybody pays." When he would light up his cigarette, he'd say, "Well, here is another nail in my coffin." 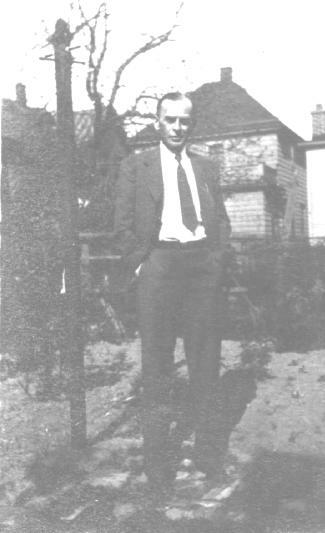 During World War II, Frank would write to his nephew, John Mary. Frank kept many of John's secret from John's parents, so as to not worry them. Frank died from a heart condition on January 9, 1953. He is interred in Lot 2, Section A, SS. Peter & Paul Cemetery, Hamburg, NY, in a grave next to his brother Joseph. 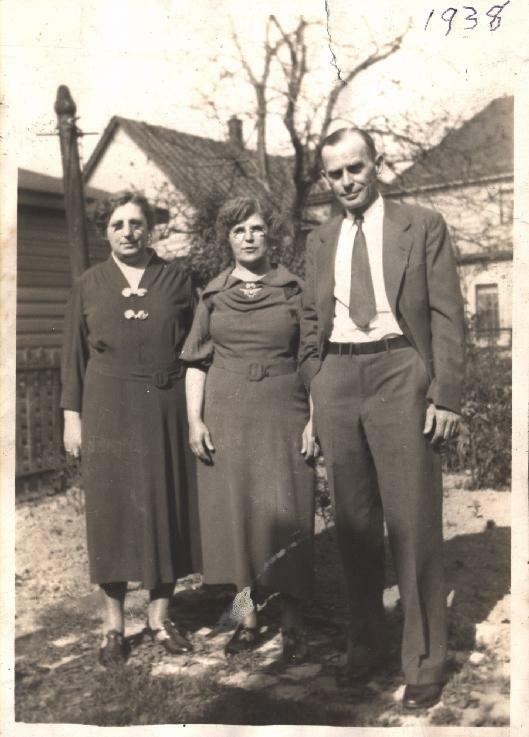 Text written by Olive Mammoser (niece of Frank J. Schwert), by Anne Marie Liebhaber (granddaughter of Anna [née Klinkusch] Liehaber), and by Donald P. Schwert. 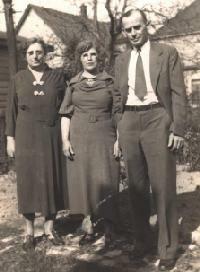 Elizabeth (née Schwert) Mayer, Martha (née Schwert) Mary, and Frank J. Schwert, 1938. Julia Anna (née Schlia / Schlee) Schwertfeger / Schwert: Born 1854; died 1938. 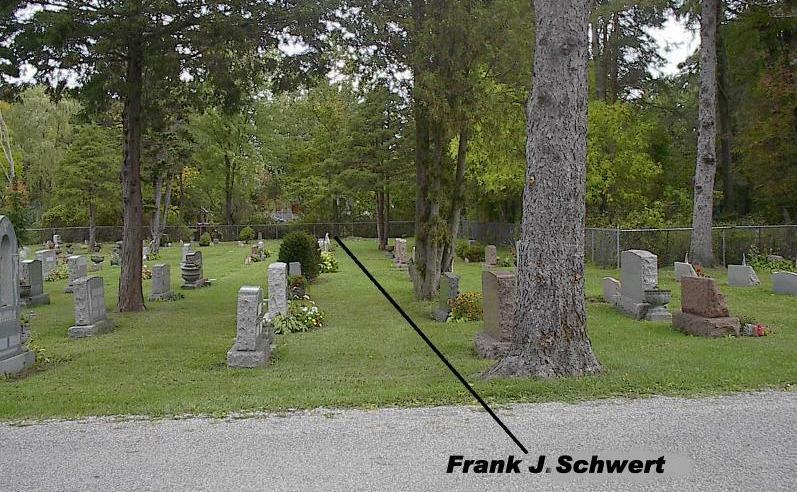 General location of the gravesite of Frank J. Schwert, Saints Peter & Paul Cemetery, Lot C2, Sec. A, Hamburg, NY. A map to the gravesite is available here. 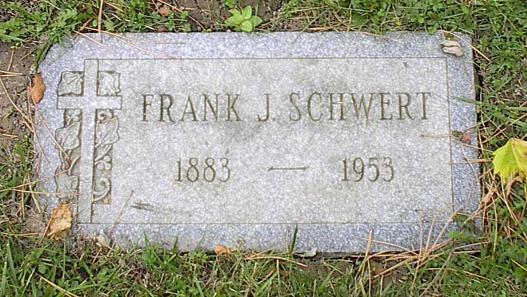 Grave of Frank J. Schwert, Saints Peter & Paul Cemetery, Lot C2, Sec. A, Hamburg, NY. Baptismal Record: Frank Schwert, born January 26, 1883, baptized January 28, 1883, by Father Wagner, Saint Boniface R.C. Church, Buffalo. 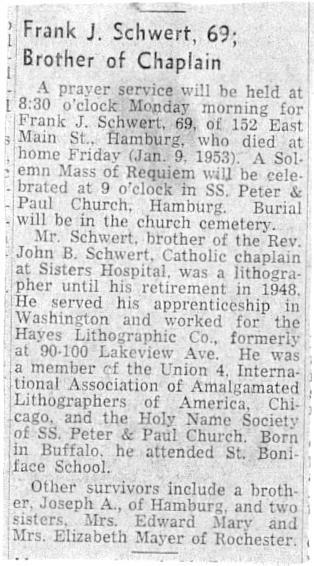 Obituary: Frank J. Schwert, died January 9, 1953. 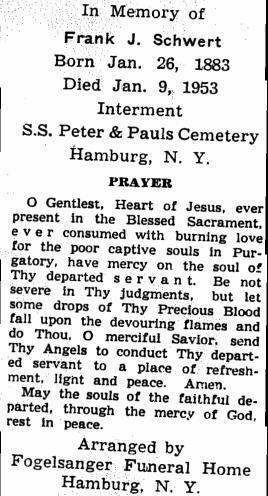 Mass Card: Funeral of Frank J. Schwert.